Million Dollar Solopreneur is a book with a bold claim. ``This book can make you wealthy, can give you more time and freedom, and can create more meaning in your life.`` In fact author`s boldest claim is: ``This book`s lessons, if implemented correctly, can give you financial freedom for life in just the next 12 months. But this is no tall claim, since the author himself is a serial Solopreneur and has created multiple business (Such as Your First Million Dollars) that have helped a number of professionals live the life of their dreams. 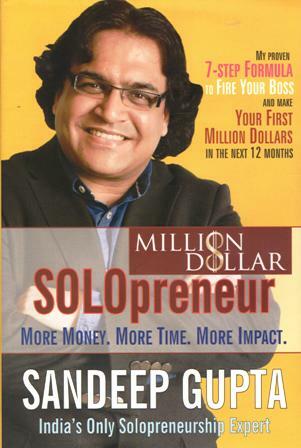 Sandeep Gupta : Over the last 18 years, Serial Solopreneur Sandeep Gupta-through an array of programs such as Life Without A Boss, Your First Million Dollars, Million-Dollar Solopreneur, Know the World in 24 Hours, B.O.L.D-Beware of Lady Dynamites. The Jet-Set Speaker -Be The Millionaire Messenger, Your First-book, Ti-Summit Storytelling System, and The Laughter Lever-Has helped more than 50,000 professionals live the life of their dreams. Many of his students have become Impact Solopreneurs- Speakers, Authors, Seminar Leaders, Online Marketers, Video-Product Creators, and Consultants-and have attained Financial freedom for life. All his programs have a unique promise -more money, more time and more impact.